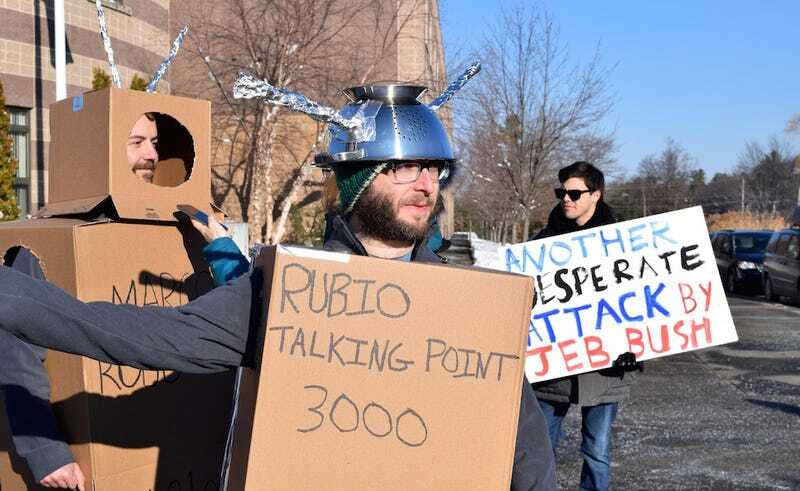 At 8:30 AM outside of Londonderry High School in New Hampshire, a man in a “Marco Roboto” suit entered into a brief but heated argument with a Rubio staffer. The lie being spread, it appeared, was that Rubio is a robot. The “Pancakes with Rubio” event, outside which the encounter occurred, was scheduled less than 12 hours after Rubio repeatedly glitched during a heated exchange with Gov. Chris Christie in ABC’s GOP debate. Rubio ultimately emerged over 40 minutes late to the event, which was notably devoid of pancakes. A handful of slightly outdated top 40 tracks played on repeat. “He’s just doing his stump speech,” a tired-looking camera man whispered to his colleagues. Not long after, half the press pen packed up their gear and shuffled out. Rubio had drastically set back their schedules and he wasn’t going to say anything interesting. A portion of the audience followed them out.